This review is for MaxiHair sold by Nature’s Best. This supplement contains 22 nutrients to ensure better health which will be reflected in great looking hair. It contains specific nutrients that are specifically geared to help hair grow quicker and stronger. Read on to learn more about this natural supplement. • Folic Acid- helps tissues and organs grow and help with hair loss. • Biotin- one of the most important vitamins for hair growth. It is recommended to take 1 capsule twice a day with food. Each bottle is enough for a 30 day supply and contains 60 capsules. It is safe for pregnant and nursing woman. The product should be kept out of reach of children because it contains iron. There are no side effects listed on the website. If there are any slight side effects, they will usually subside after using the product for a while. All of these nutrients are necessary for the health of the body but should not be used as a substitute for a healthy diet. The product is produced in Great Britain. In the United States one bottle would cost $16.27. The product is not guaranteed to work on your hair so you won’t get your money back if you are not satisfied with the performance of the product. There are eight customer reviews at this time on the website. The result was 5 out of 5. If the product was used consistently and continually, it seemed to help the health of hair and limit the amount of hair that was lost. MaxiHair sold by Nature’s Best does provide many nutrients that can help improve the function of the overall body as well as the hair. The reviews that are on the website are all positive. The product does not provide a money back guarantee. It is also only sold out of the country and there is a considerable surcharge for shipments to the United States making the price quite high. It also requires a lengthy delivery time of at 4 weeks. Even though there are many vitamins that can improve your overall health, there are many products available in the United States that would be less expensive and more readily available. 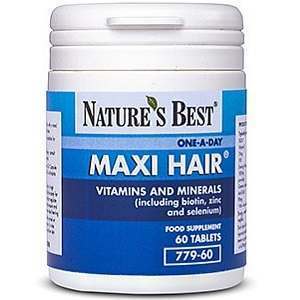 John Brownstone	reviewed Nature’s Best MaxiHair	on November 24th	 and gave it a rating of 3.